My Trouble in God’s Country research has been focused primarily on the widening economic, educational and health divides between Metro Atlanta and the rest of the state, especially rural Georgia. The extent of the political divide has been obvious and well understood for a long time, and it’s not a topic I’ve paid much attention to. But last Tuesday night, as I watched the election results come in and poked around on the AJC and Georgia Secretary of State’s websites for county-level returns, I noticed that Democratic gubernatorial nominee Stacey Abrams seemed to be lagging behind her party’s 2014 gubernatorial nominee, Jason Carter, in rural Georgia but outperforming him in Metro Atlanta and other urban areas. Did that mean, I wondered, that urban and rural Georgians were continuing to grow even further apart politically as well as economically, educationally and health-wise? To answer this question, I pulled top-of-ticket results for the last five general elections in Georgia – the 2010 gubernatorial election, 2012 presidential, 2014 gubernatorial, 2016 presidential, and 2018 gubernatorial. Yeah, you can quibble with comparing gubernatorial and presidential results, but in this case I think it’s useful. As a backdrop, it bears noting that virtually everybody agrees that population growth and demographic change are working to the advantage of Democrats and will eventually tip the state back to their advantage. That’s inarguably true. But against that backdrop, the first conclusion to be drawn from the 2018 results is this: Rural Georgia ain’t going down easy. As of the results posted on the Secretary of State’s site Monday morning, November 12, Republican gubernatorial nominee Brian Kemp is leading in 130 mostly rural counties while Abrams is ahead in the other largely urban 29 counties. The counties Kemp is carrying are home to 2.9 million registered voters versus 3.5 million in the Abrams counties. The second obvious factor was margin. Kemp is winning bigger in his small rural counties than Abrams is in her big urban ones. Which is saying something, because Abrams is ahead by a margin of 66.7 percent to 33.3 percent, or 2:1. Kemp, though, is running up the score in his 130 counties by a margin of 71.4 percent to 28.6 percent. And there are some interesting subplots under those topline numbers. In Metro Atlanta, for example, heavily black and Democratic Clayton County, on the southside, went overwhelmingly for Abrams: 88.2 percent to 11.8 percent for Kemp. But turnout was only 54.2 percent. Clayton County gave Abrams her largest margin of victory but one of her smallest turnouts. On the north side of Metro Atlanta, meanwhile, heavily white and Republican Cherokee and Forsyth counties went for Kemp by a combined margin of 72.5 percent to 27.5 percent — and their combined voter turnout was 63.5 percent, nearly 10 points higher than Clayton County’s. If Clayton County had matched the Cherokee-Forsyth turnout levels and maintained the same 88:12 split, Abrams would have netted another 12,000 votes. Back to my original question: Is the political divide widening between Metro Atlanta and Rural Georgia? The answer is an unequivocal yes – although you might not know it just to look at the statewide results. In 2010, former Governor Roy Barnes, the Democrat who eight years earlier had surrendered the governor’s office to the first Republican winner in a couple of thousand years, was making a comeback attempt against Republican nominee Nathan Deal; Deal won handily, 55.2 percent to 44.8 percent. In the 2012 presidential election, GOP nominee Mitt Romney got 54 percent of the vote to 46 percent for President Barack Obama, the incumbent Democrat. In the 2014 governor’s race, Governor Deal beat Democratic challenger Jason Carter by the same 54-to-46 margin. In the 2016 presidential election, the margin actually got a little closer: Republican Donald Trump beat Democrat Hillary Clinton here in Georgia 52.7 percent to 47.3 percent, a margin of 5.3 percentage points. And, of course, the margin in the current governor’s race is razor thin: Of the votes cast for either the Democrat or the Republican, Kemp currently has 50.8 percent of the vote to 49.2 percent for Abrams. So, over the past decade or so, the Republican margin of victory peaked at a little over 10 percentage points and has lately been shrinking down to a point or so. But where those votes are coming from has shifted dramatically. Big Democratic Counties. These are 16 counties that have at least 25,000 registered voters and have generally voted Democratic over the years. It includes the big ITP counties in Metro Atlanta and a couple of recent newcomers to the Blue column, Cobb and Gwinnett. More than half the state’s registered voters live in these 16 counties. In 2010, Barnes carried these counties over Deal by what seemed like a healthy 57.3 percent-to-42.7 percent margin. This year, Abrams is leading Kemp 2:1 in these same 16 counties. Put another way, these counties have shifted 9.8 percentage points further into the Democratic column. One measure of this group’s population growth and rising clout is that Abrams already has more votes from these counties than Barnes and Deal combined in 2010. Small Republican Counties. This is a group of 101 rural counties with fewer than 25,000 registered voters, and it’s pretty much a polar opposite of the Big D counties above. In 2010, Deal carried these counties 2:1 over Barnes; this year, Kemp is ahead of Abrams just a hair shy of 3:1. As a group, these counties are 7.7 percent redder now than they were in 2010. The problem for Republicans is that many of these counties, especially in Middle and South Georgia, are hollowing out and losing population. They may still be able to run up the score in these areas, but there’s not enough growth to keep up with the Big D counties. Large & Middle-Sized Republican Counties. This is a group of 29 counties with at least 25,000 registered voters that are lining up with Kemp and other Republicans in this election cycle. It includes most of the suburban and exurban counties surrounding Atlanta, as well as fast-growing communities in North Georgia and bedroom counties around the state (Oconee, Houston, Columbia, etc.). The good news for Republicans is that these are for the most part growing counties and they are overwhelmingly red. The less than good news is that they aren’t getting any redder; in fact, as a group, they’re 3.3 percentage points bluer this year than they were in 2010. One example: Forsyth County gave 85.2 percent of its 2010 vote to Deal and only 14.8 percent to Barnes; this year, Kemp is carrying Forsyth with a relatively meager 71.6 percent to Abrams’s 28.4 percent. That’s a 13.6 percentage point shift toward the Democrats in a decade. Still, the GOP’s future in Georgia probably lies in retrenching in these counties. Small Democratic Counties. These are 13 largely rural and heavily black counties with fewer than 25,000 registered voters that are still voting Democrat, but – like the Small Republican Counties discussed above – they’re actually trending Republican. In 2010, they went nearly 60:40 for Barnes; this year, they’re a paler shade of blue and going 55:45 for Abrams. If that’s good news for Republicans, the bad news is that, combined, these counties cast fewer than 90,000 votes. 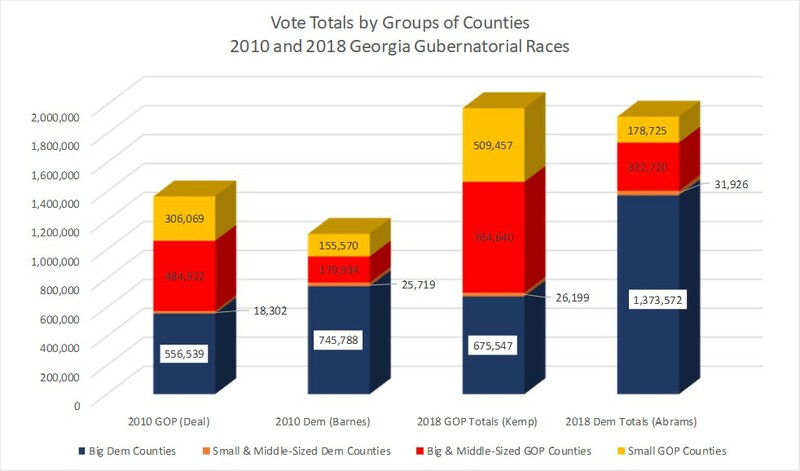 So, urban Georgia is getting bluer and rural Georgia is getting redder. This is obviously just a local example of the divide taking place all over the country and of the extreme polarization that has afflicted U.S. politics in recent years. This chart shows Democratic and Republican votes by groups of counties for the 2010 and 2018 gubernatorial elections. A key takeaway from this chart and analysis is this: If Brian Kemp hangs on and wins this election, he’ll owe his victory to two very disparate voting blocs of Republicans – very affluent, well-educated suburban and exurban voters on the one hand, and some of the least educated, poorest (and for that matter least healthy) voters in rural Georgia on the other. My hunch is that their public policy priorities are very different, and balancing their interests will require a nifty bit of political magic. Big Democratic Counties: Bibb, Chatham, Clarke, Clayton, Cobb, DeKalb Dougherty, Douglas, Fulton, Gwinnett, Henry, Liberty, Muscogee, Newton, Richmond, Rockdale. Big & Middle-Sized GOP Counties: Barrow, Bartow, Bryan, Bulloch, Camden, Carroll, Catoosa, Cherokee, Columbia, Coweta, Effingham, Fayette, Floyd, Forsyth, Glynn, Gordon, Hall, Houston, Jackson, Laurens, Lowndes, Oconee, Paulding, Spalding, Thomas, Troup, Walker, Walton, Whitfield. Small Democratic Counties: Baldwin, Calhoun, Clay, Hancock, Jefferson, Macon, Randolph, Stewart, Sumter, Talbot, Taliaferro, Terrell, Warren. Small Republican Counties: Appling, Atkinson, Bacon, Baker, Banks, Ben Hill, Berrien, Bleckley, Brantley, Brooks, Burke, Butts, Candler, Charlton, Chattahoochee, Chattooga, Clinch, Coffee, Colquitt, Cook, Crawford, Crisp, Dade, Dawson, Decatur, Dodge, Dooly, Early, Echols, Elbert, Emanuel, Evans, Fannin, Franklin, Gilmer, Glascock, Grady, Greene, Habersham, Haralson, Harris, Hart, Heard, Irwin, Jasper, Jeff Davis, Jenkins, Johnson, Jones, Lamar, Lanier, Lee, Lincoln, Long, Lumpkin, Madison, Marion, McDuffie, McIntosh, Meriwether, Miller, Mitchell, Monroe, Montgomery, Morgan, Murray, Oglethorpe, Peach, Pickens, Pierce, Pike, Polk, Pulaski, Putnam, Quitman, Rabun, Schley, Screven, Seminole, Stephens, Tattnall, Taylor, Telfair, Tift, Toombs, Towns, Treutlen, Turner, Twiggs, Union, Upson, Ware, Washington, Wayne, Webster, Wheeler, White, Wilcox, Wilkes, Wilkinson, Worth. 2018 may be an outlier. You had the Trump factor – to the point where longtime Republicans like George Will authored columns like this https://www.washingtonpost.com/opinions/vote-against-the-gop-this-november/2018/06/22/a6378306-7575-11e8-b4b7-308400242c2e_story.html – as well as an exceptionally unpopular, divisive and unqualified GOP candidate who magnified his problems by embracing and emulating Trump. By 2022 Trump will either be out of office – dare to dream – or will be halfway through his second term, resulting in a national political realignment (for example he would get to replace Breyer or Ginsburg and possibly both on the Supreme Court). In either case, the “protest vote” of suburban Republicans will die down. We’ve consistently heard since the 1990s that GOP suburbanites were leaving the party but it is never sustained. Either they return to the GOP fold or they are replaced by new suburban GOPers. So rather than taking Georgia’s going blue to be inevitable – claims that have been made about Texas and Florida for years also – this year was rather a potential perfect storm to create conditions ideal for the Democrats to obtain the governorship that they failed to capitalize on, largely because of their choice of candidate. A Zell Miller or Sam Nunn would have taken down Kemp easily, but it appears that the Georgia Democrats are adamant against nominating moderate Democrats. Wait… So you’re saying Abrams was a “moderate” Democrat? C’mon. You can’t be serious.